Have you ever figuratively called something an institution? For instance, you’ve heard people say that the University of North Carolina is a College Basketball Institution. Who’s going to argue with that? UNC has played basketball with a level of excellence, passion, and class for such a long time that they have only a few schools that are roughly comparable. It’s quite a complement to be referred to as an institution. When I refer to something as an institution, I’m dead serious. I don’t use the term lightly. Hold your breath! Margie’s Candies at 1960 North Western Avenue is a Chicago Institution, and I’m not messing around. Notice also that I only use a single modifier with the word institution. A single modifier institution (SMI) is the ultimate complement. I could have said it’s a Chicago Ice Cream Institution and that would have grouped it with other fine ice cream purveyors in town. But by just calling it a Chicago Institution, I’m saying that it’s worthy of comparisons to not only other Chicago food institutions, but any other great, Chicago landmark institution like the Steppenwolf Theatre or the Joffrey Ballet. I’m saying that Margie’s is as much a part of the fabric of this city as those venerable institutions. Margie’s has served homemade ice cream and candy from this tiny north side spot since 1921. Here is a more detailed history from the Chicagoist blog. I’ve been hearing of Margie’s for about a decade now but didn’t venture there until about a year ago, when some good friends bought me a box of Margie’s chocolates for my 40th birthday. Man were they good. That was when I started noticing how people talked about Margie’s. It almost makes you cry when you listen to heartfelt stories of how special it was to visit Margie’s as a kid. I’ve started mentioning Margie’s whenever I meet someone that grew up on the north side so I’ve heard a lot of these stories lately. I’ve been there multiple times but never sat down in the place for ice cream. So, it was only fitting that my wife and I and another couple went there after a stellar meal at Think Cafe (no pictures, sorry) a few weeks ago. It was a Friday night at about 9pm and the wait was about 15 minutes. The clientele defies explanation. It’s kids, teens, young adults, and old people. It’s hipsters, parents, artists, and professionals. It’s all ethnicities crammed into a store front that can’t have a footprint much more than 600 square feet. Plus it’s old, real old. It has that old smell too. That smell that you know is just from stuff being old, not from being dirty. And the middle of it is taken up with this huge display case of their chocolates. The decor is dated. I won’t lie, it feels like you’re stepping into the way-back machine and punching in about 1950. But when the wait staff sets the clam shell bowl of ice cream in front of you, who cares. 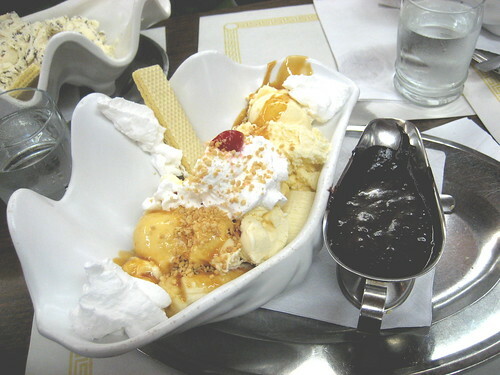 Pictured is the Turtle Sundae, which is Margie’s signature dish. The ice cream is fine. It has a wonderfully high butterfat content, but I’ve had ice cream as good elsewhere. There are other things that really set Margie’s apart. First, that clam shell bowl really allows them to spread out the ingredients for maximum in-bite aggregation. Let me explain. When you get a sundae in one of those tall parfait glasses or even one of those large round bowls, the ingredients clump together in horizontal layers and it’s difficult to get all the way to the bottom so that you can each ingredient in each spoonful. Not so with the clam shell bowl. Margie’s has the whipped cream, ice cream, and toppings laid out on the vast clam shell stage so you can pick and choose the exact amount of each ingredient that you want in each spoonful. Second, the chocolate comes on the side in a warmed, decorative tin. This is a great touch. It insures that you get really hot fudge. Your fudge doesn’t sit on the ice cream in a prepared state just cooling down while the wait staff services other people. It comes hot, on the side, so you can add it whenever. It really allows you to completely customize the experience. I like to do two pours so I can have hot fudge throughout the experience. Oh, did I mention that the chocolate is delectable. Finally, they add some standard ingredients that aren’t so standard at other places. My Turtle Sundae had a fresh banana and a fine, European style cookie in it. Both were great touches. I go two-fisted with the cookie to start things out. That means I put the cookie in my left hand and the spoon in my right. I scoop up some ice cream and topping with the spoon, put it in my mouth, then follow up with a bite of the cookie before I even start any major jaw movement. With the banana, I try to parse it out so that I can have a little with each bit. It gets you about half way through it. Like I said, it’s a Chicago Institution, and I don’t use those words lightly. Posted in food, tagged ORD layover on 2007/10/08 by John.